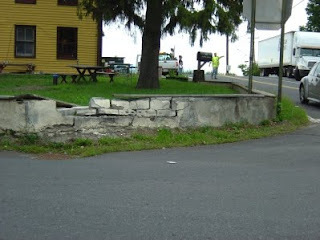 What better way to start the day than with a little bit of retaining wall run-over. Fortunately, it was after breakfast, but the whole thing threw me off so much, I had to have another (French) mug of coffee. And the damage is piling up. The irony is, that I had meant to fix the wall this weekend, especially because we received the check from the previous incident in the mail today. Now some of you may think "great, you get more insurance money coming in", to which I have a few words. Screw the money!!! The agony of having to deal with things like that cannot be compensated by the few bucks we may get from the insurance. Not only do I have to spend time and energy to deal with the insurance, I have to spend time and energy to actually fix the damage. I have neither time, nor energy, but I feel compelled to fix the retaining wall anyway, because it is an eye sore otherwise. So why don't I let it slide? Because I can't and I shouldn't. Although the retaining wall isn't in the best of shape, and will need some fixing anyway at some point in time, it is still standing, and it serves the purpose of holding back the soil, and this function needs to be maintained. 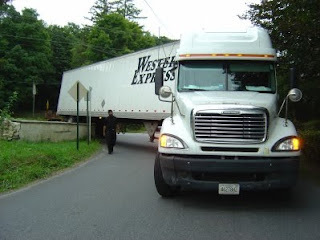 The first driver I caught running over the retaining wall (he actually didn't break it, but merely dented it) I would have let go without anything, if, IF he had pulled over and handled it in a professional manner (accidents happen, but we need to take responsibility for them anyways). Instead he quickly glanced at the carnage and continued his journey. I had to chase him down to his final destination, an apple farm two minutes away. He accused me of only doing it for the money. I told you, I could care less about the money. So instead of letting him go for free, I felt compelled to charge him $75 (an outrageous amount of money) to fix the little damage he did. What do we learn from this? Take responsibility for your actions, you will be better off. Subsequently, this day was over at 10am for me. In case you don't know, this project costs an enormous amount of energy (yes, I worry a lot, and I have sleepless nights, at least once or twice a week), and my battery has been in the red for quite a while, therefore anything unforeseen that requires even the smallest amount of energy throws me off completely. 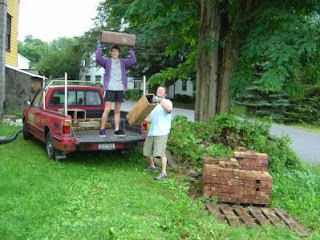 I put my German immigrant laborers to work today, schlepping bricks and chimney flutes, which I had stacked behind the house. They have to make room for the septic tank. It was a showcase of the German traits of efficiency and precision. Should we make a sign this weekend? I'm up for a painting party . 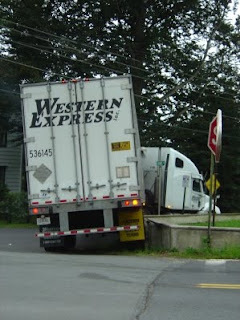 . . picture of a semi turning right with a big circle and slash through it?